Just received a call back from Environment agency. On the day of the smell, the incinerator was burning, and had an alkaline wash through which can produce that awful smell. They want people to know that they are regulating the site and they need more people to phone them when there are issues like this so that they can make sure the site is performing within its designated limits. They are now going to look into the issue and data from the site and pollution sensors in the area to get an indication of what went wrong. Spoke to a lovely lady who was very much on the side of residents. Hackbridge stunk this morning of burning/burnt diesel this morning. I noticed it between 7:50am and 8:30am. At least to one campaigner, this moment, right now, feels a bit like the moment Neville Chamberlain had to accept that attempts to stop Hitler invading Poland had failed. Of course the two are incomparable but it is a sad moment when the unthinkable, then becomes inevitable and then a sobering reality. Apologies if the war analogy is too strong but imagine putting 10 years of your life into stopping something catastrophic in the eyes of many. Fellow campaigner Peter Alfrey noticed the burners were fired up on the 5th of January. IMPORTANT REMINDER: During this commissioning phase, please keep a diary of noise, visibility affecting steam and odours. THIS INCINERATOR IS NOT SUPPOSED TO BE NUISANCE. PS Once again. no offence was meant to be caused by the analogy. An article on this appears here. Burners to be fired up imminently. Those of us involved in the campaign are used to one thing being said and another being done. The latest example is the actual commissioning process for the incinerator. Originally set for 2018, it seems the burners will be fired up in the tail end of 2017. An image of what the incinerator looks like is here (apologies we’ve used up all our space and new images cannot be uploaded). Local news and reaction covering how this news came to light can be found here and here. The commissioning stage of an incinerator, before it is fully operational, is broken up into ‘cold’ commissioning and ‘hot’ commissioning. The more dangerous period is the latter, when feedstock is sent for incineration for the first time. With all that combustible material near a burner, the risk of fire is greater. When all is said and done, the construction of the incinerator and its imminent operation could have been prevented if THREE of the FIVE Lib Dem councillors on the Planning Committee voted against the incinerator. Read more about what happened here. It’s four years since that fateful moment. To mark the anniversary we will be demonstrating outside the Sutton Civic Centre at 6:45pm on the same evening the Planning Committee meet. Hackbridge & Beddington Corner Neighbourhood Development group have had a meeting with Sutton council about the SDEN* planning application to start building part of the pipe line that could be connected to the incinerator. Sutton council give the incinerator the misnomer ‘Beddington Energy Recycling Facility (ERF)’. The consultation period has been extended to 15th February 2017, so there’s still time to comment. Lewisham council did a report and found that in residential properties there are problems of overheating, as heating is not constantly required from decentralised energy networks from incinerators. The heat is expensive. The carbon saving figures are not accurate. Halting the awful incinerator would help us reduce carbon. We have too many incinerators already and there is not enough materials to feed them. Also the building developer does not have to build energy efficient properties if there’s an incinerator heat network. Further making a demand for expensive inefficient energy. Also the energy network lasts twice as long as incinerators and would give the council an excuse to keep the incinerator going for longer. Old power stations from decades ago are far more efficient in producing energy than incinerators. The stack of the Beddington incinerator is already to be twice the size of St Paul’s Cathedral. 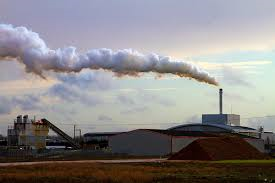 Policy needs to change to kick incinerators out of the energy mix, by these companies who’ve lobbied parliament to drain more money from the public purse for their own gain at the expense of the every day person and the environment. Burning our rubbish costs at least 5 times more than landfill. Thanks to Maeve Tomlinson for the above details. Peter Alfrey recently posted on the Stop The Incinerator Facebook group this video of the chimneys being affixed to the incinerator. A picture can be viewed here. Some recent coverage on Inside Croydon is here.